Islamic Boutique online store for Islamic Clothing and abaya. The Muslim dress collection includes abaya, niqab, jilbab, khimar, and hijab. All sizes are available from small to plus size Islamic clothing. All abayas are tailored to measure according to selected size in order and it takes 1 week to be tailored plus the delivery time. Islamic Boutique don't stock ready made abayas, and only stock fabrics. 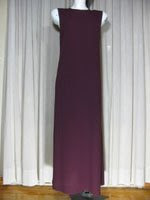 So any size or height could be done in the model of customer choice from our wide variety of Muslim dress models. Selling Islamic clothing online is Islamic Boutique's specialty since 2002. This category includes clothes to be worn under the abaya. The collection includes under-skirt, under-pants and slip dress. If you get interested click HERE. 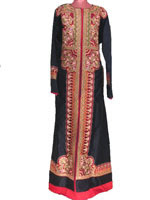 The garments listed in this category is known as jilbab and in Egypt it is called Galabeya (Egyptian Galabeya). They are suitable for in home wear, in home receptions, sister gatherings especially in summer, Yet it will not be recommended for this type of jilbab to be wore when going to mosque as they are decorated and they are considered modest wear but don't comply with Muslim dress code. The jilbabs are categorized by size and under each Jilbab the exact measure of the jilbab displayed is written and this is what you will get so please read measures carefully before buying as Islamic Boutique don't tailor this jilbabs and can't alter size or length. If you get interested click HERE. A niqab is a veil which covers the face. 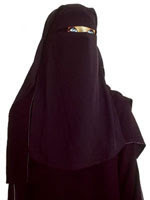 The collection includes many different styles of niqabs. If you get interested click HERE. New style khimar that cover from the top of head to below waist line and comes with tie back under scarf. Available in different colors. If you get interested click HERE. 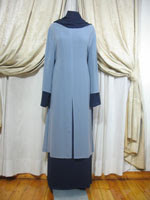 All abayas listed under this category are tailored to measure. It takes 1 week to be tailored from order date. If you are not sure about your size or need a special size please use special size in left menu to send your measures when making order. If you get interested click HERE. If you would like to earn 5% to 10% on sales made through a link to Islamic Boutique from your site or email, it's as easy as filling out a simple form, setting up the link and hopefully sitting back to watch the sales come in. Receive monthly payments via Paypal (make an account if you do not have). If you get interested click HERE.